There’s a secret to perfect BBQ back ribs. One that will get you awesome ribs every time. Every time. It’s not hard. Internal temperature. That’s it. Cook your ribs until an instant read thermometer inserted between the ribs (never touching the bone though) reads 195F. A smoker makes this pretty easy but it takes forever. Somewhere around 5 hours for baby back pork ribs. This recipe gives you perfect BBQ back ribs in about 2 hours. Still slow but not crazy slow. Anywhere between 190F and 200F is in the zone but 195F is the magic number. Below 190F and they will be tough and chewy. Much above 200F and they will start to dry out. 195F gets you perfect BBQ back ribs. Tender but firm with that little bit of pull when they come off the bone. Championship ribs. There’s art to BBQ. But there’s science too. Tending your fire. Timing. Just the right amount of smoke. That’s art. Cooking to a specific internal temperature. That’s science. BBQ takes meat way past the normally recommended internal temps and yet it can be moist and tender. That’s magic. Pork guidelines are around 140F these days. Take it up to 175F and your pork turns to dust. Take it up to 195F though, and something wonderful happens. The tough connective tissue and collagen melts and suddenly the meat turns moist and tender. Works with most tough cuts. It’s the same phenomenon you see when you make stew. Melting that stuff is what makes perfect BBQ back ribs work. These ribs are done on the classic Weber kettle at around 325F. You need to use lump charcoal or pure charcoal briquettes. You can’t use regular briquettes here because you will be lighting some briquettes about half way through the cooking process. Fast start briquettes are treated with chemicals that you have to burn off before you use them. You could also use a gas grill if you want. You will need to burn wood chips though, or you might as well use the oven. Real BBQ is all about the smoke. The concept is simple. Mound your charcoal on both sides (I have the Weber charcoal baskets – they work well). Put a tinfoil drip pan down the middle. Light one side adjust your airflow so your grill comes up to 325F. Put them above the drip pan, rib side down. Cook your ribs, turning them 180 degrees every 15 to 20 minutes. When your fire starts to get low, light the other side. Keep cooking, turning every 15 to 20 minutes. Start checking internal temp after about an hour. Big meaty back ribs will take about 2 hours. Leaner ribs could be done in as little as an hour – you should start checking internal temp after about 40 minutes. When they hit about 190F you can sauce them. Or you can serve them dry – try that some time. It’s delicious. Either way, perfect BBQ back ribs are better than most any restaurant is serving. Outside the US BBQ belt anyway. 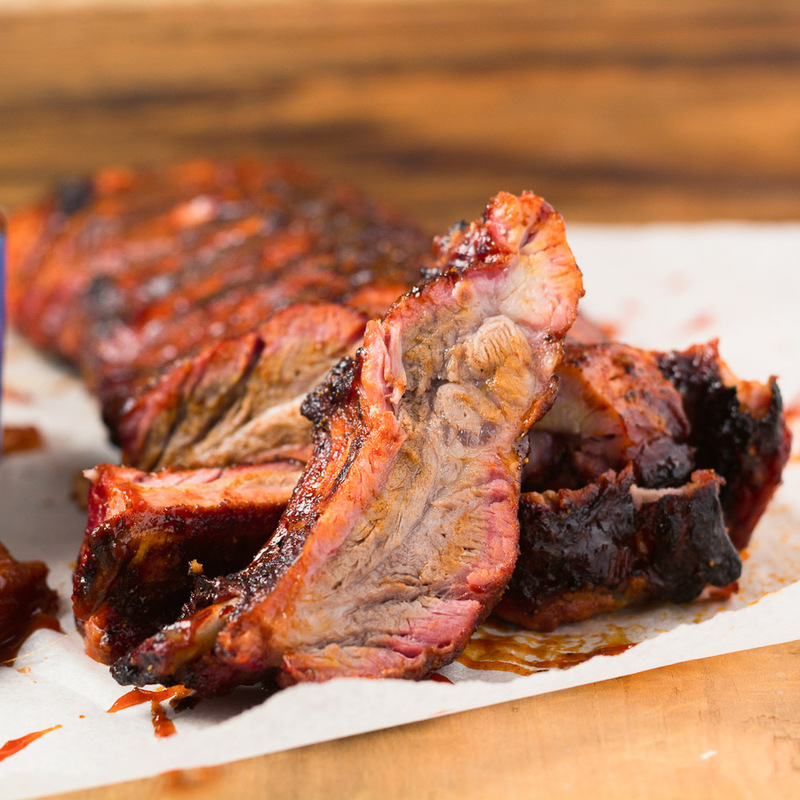 Cook the back ribs to an internal temp of 195F and sauce them with a simple bourbon BBQ sauce for award winning ribs every time. Bank lump charcoal or pure charcoal briquettes along opposing sides of a Weber kettle. Place a drip pan between the banks of charcoal. Light one bank of coals. Control your airflow so the kettle settles at around 325F. If you are using a gas grill light one burner and prepare your wood chips. Place your drip pan along side the lit burner. Rub the ribs all over with the dry rub. Place the ribs on the preheated grill above the drip pan. Keep the ribs away from direct heat. Cook, rib side down. Rotate the ribs 180 degrees end-to-end every 15 to 20 minutes. When the fire starts to burn out, light the lump charcoal on the opposite side. Continue to cook, turning the ribs every 15 to 20 minutes. After about 1 hour start checking internal temperature using an instant read thermometer. Measure in a few places between the ribs. Make sure the probe doesn't touch the bone. If it does, it will read wrong. Cooking time can be as little as one hour if it's a lean rack. A meaty rack can take up to 2 hours. When the ribs reach an internal temperature of 190-195F sauce and cook another few minutes. You can cook two racks using this technique. You don't ever want the ribs over direct heat. 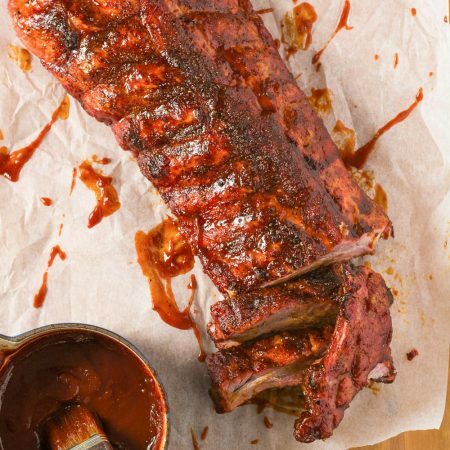 If you want to cook more ribs, use a rib rack. It's a bit trickier to rotate the ribs but it is doable if you are diligent. Use pure chili powder in the rub and sauce if you can find it. New Mexican red or Ancho are ideal. BBQ sauce makes enough for 3-4 racks. In american, bbq and grilling, main course, meat, pork. Bookmark the permalink.